According to Calendar of the International Space Science Institute, the Workshop of the group “Multi-instrument Space-Borne Observations and Validation of the Physical Model of the Lithosphere-Atmosphere-Ionosphere-Magnetosphere Coupling” was held in days 15-19 September. The following members of the group were present: M. Lisi, J.-Y. 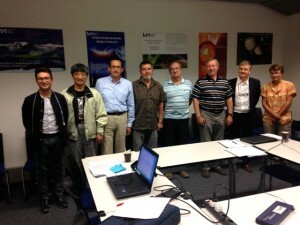 Liu, D. Ouzounov, A. Namgaladze, M. Parrot, S. Pulinets, V. Tramutoli and E. Pokojská (invited). It was decided to have intermediate working meetings in November 2014 during the workshop in China where the presentation on behalf of the ISSI project will be done, during Fall AGU Meeting in San-Francisco in December 2014, and during the EGU 2015 Assembly in April 2015. It was decided to plan the final meeting of the group in Bern in dates 15-19 of June 2015.